Bermondsey is home to an increasingly artistic scene which is largely undiscovered by its local community. The Bermondsey Street Area Partnership (BSAP) are producing a local arts map that pinpoints these creative hot spots is an opportunity to strengthen and celebrate the local community through the arts, making art accessible to all pockets of the community. The Bermondsey Square Community Fund is supporting the map will be produced by local artists, providing visitors with the best possible experience of the local art community. BSAP is an independent and non-political voluntary group; its aim is to positively promote the interests of all sectors of the community, both business and residential, and to support the traditional mixed-use character of the area. The BSAP provides a forum of discussion for those who live and/or work locally and are affected by issues raised by the changing face of the neighbourhood, consisting, loosely of the Bermondsey Street Conservation Area, designated by Southwark Council in 1973. 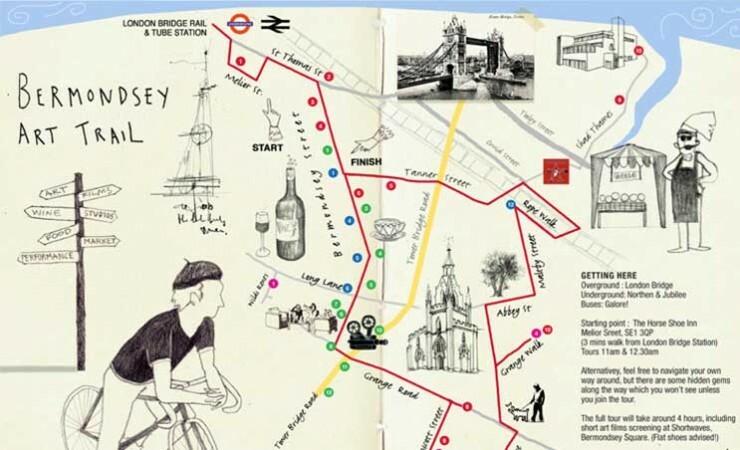 To maximise the potential of the Bermondsey Art Map, it will be launched on 12 July 2014, with a series of guided tours, led by local artists or curators, visiting local galleries and artists’ studios, hosting a series of drinks receptions and workshops to showcase their work. This is an opportunity for the local community to discover these hidden spaces and works in the area and be introduced to gallery owners and artists along the way. The launch day will also coincide with an evening outdoor event taking place on Bermondsey Square, which will increase footfall on the day.